By Botswana journalist Sharon Tshipa, first published at Weekend Post. 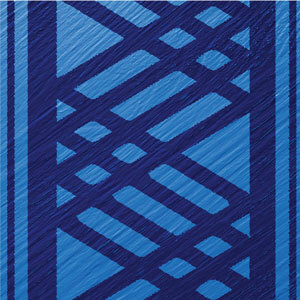 Photo story first published at SOPA Images. To eradicate poverty, the President of Botswana, Ian Khama in his inaugural address in 2009 identified poverty eradication as one of his flagship programmes. The coordination thereof was subsequently housed in the Office of the President. Packages introduced were mostly agricultural. Such range from bee keeping, backyard gardening, poultry, backyard tree nursery and landscaping to cite a few. The ineluctable fact is that the government did not take up arms against poverty alone. Embassies, the private sector and other independent stakeholders were implored to help. The Chinese Embassy in Botswana and the Chinese people living in Botswana are among those that answered the appeal, subsequently playing a plausible role in the agricultural sector. The Ministry of Agriculture’s Division of Research and Statistics says, about 69 percent of the population benefits from agriculture –as farmers, labourers or both. However, due to regular and prolonged droughts, the Ministry states that both crops and livestock have not been performing as expected. Notwithstanding challenges exacerbated by climate change, “the Chinese government has contributed to this industry through training. A few of our officers have attended courses in Head Management, Poultry, and Equines. Some traveled to China to benchmark, observing modern technologies employed by China,” says the Ministry’s Chief Information and Public Relations Officer, Boikhutso Rabasha. “It’s about time we diversified farming in Botswana. We cannot fight changing weather patterns or do anything about unpredictable rains, but we can look for and invest in plants that will cope. Which is why I decided to plant moringa trees,” says Hu. He says this at a time when the Ministry of Finance and Economic Development in partnership with the United Nations are fearful that Botswana could fail to reach UN goals on poverty eradication. The Botswana Sustainable Development Goals Roadmap launched by the partners in February 2018 cites high income inequality and failure to achieve inclusive economic growth as factors that demoralise poverty eradication. Hu Yan is a Chinese moringa tree farmer based in Botswana. 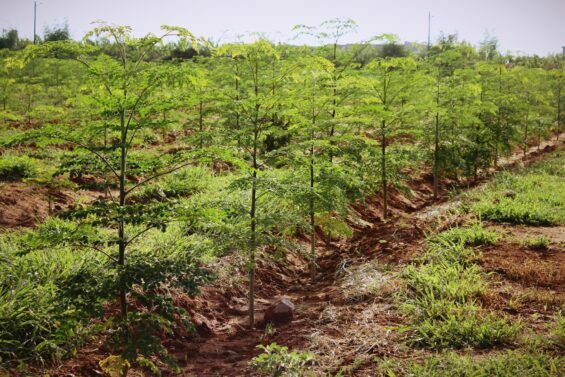 The moringa farm located in the outskirts of Tlokweng village boasts 10,000 three-meter high trees planted in October 2017 in the one section of the farm which is over 20 hectares. 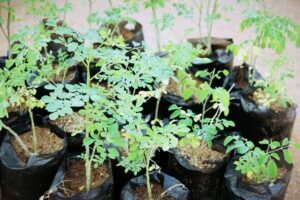 This farming project will produce moringa tea, nuts, oil and eventually juice. 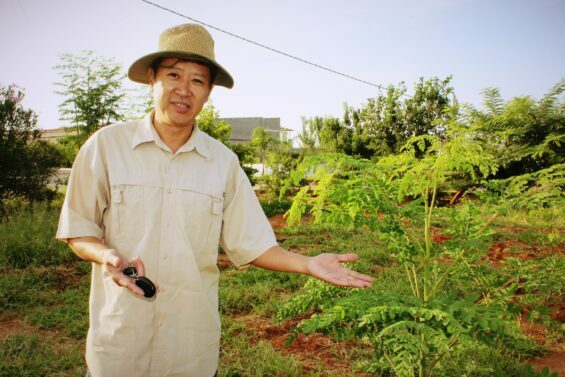 Hu Yan, is a Chinese moringa tree farmer based in the outskirts of Tlokweng village. He is one of the Chinese people that responded to the Presidential call, taking to farming regardless of the fact that Botswana is a semi-arid country with unpredictable rainfall. A challenge that continues to discourage local farmers, consequently also hampering the endeavour to end poverty. Hu has been living in Botswana since 1996, and so he now considers Botswana home, a home for which he is doing all he can to help attain food security as he is well aware of the struggle. Moringa seedlings at Hu Yan’s moringa tree farm at Tlokweng Village, Botswana. In October last year after partnering with property mogul Sayed Jamali, Hu planted 10,000 seedlings at the Tlokweng farm. After three months, most of the trees had grown to over three meters long. “We packaged several product samples this past week and took them to the President for appreciation and approval,” says Hu. His plans are to produce tea, medicinal powder, green noodles, juice and moringa nuts, then sell them to local shops, eventually exporting the surplus. 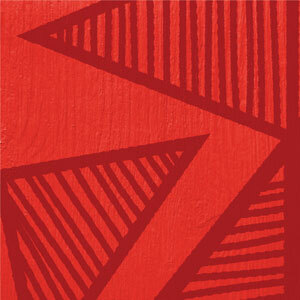 “I plan to export to China, America and Europe. This tree cannot grow in those countries because of freezing weather conditions,” he says, excited at the prospect of commencing production work in his factory in March 2018. Hu’s moringa tree farming project has not only created employment for Tlokweng villagers, it has also inspired local farmers to consider investing into the moringa tree farming business. Diomano enjoyed agricultural subjects at school, and because of this job he has been doing for Hu, he is considering planting his own trees. “I used to think that moringa was a useless thing women liked selling on the streets. I knew nothing about it until Mr Hu. 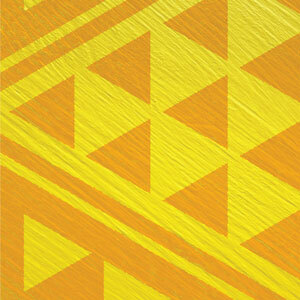 Right now I see the potential this plant has to develop and influence my life for the better,” he expounds. Before investing into the Tlokweng project Hu Yan motivated citizens to farm moringa, but his Gamodubu and Oodi village efforts failed due to lack of commitment and support on the part of his Batswana partners. The benefits of investing in moringa he says are almost immediate. As a farmer Hu’s interests do not solely lie with moringa. At the Tlokweng farm, he and his partner are currently constructing a 1,800 square meters green house with the intention to plant vegetables, fruits, and flowers to sell to the local market. “This first one is only a pilot project, if it succeeds, we will construct three more. If this farm produces to capacity we will construct other green houses in Selibe Phikwe on the land President Khama promised us,” says Hu. According to Statistics on Agricultural Produce with South Africa (SAPSA), collected between January and December 2017 by Statistics Botswana (SB), the country imported fruit juices worth over BWP178 million, but only made BWP950,703.00 in exports of the same product to South Africa. Should farmers like Thari excel, Botswana would spend less on imports and export more for a change. Should his efforts bear fruit, Botswana will spend less money on maize imports. Last year alone according to Statistics Botswana’s SAPSA, the country spent BWP10,296,729.87 on maize seeds imports from South Africa, in turn making only BWP294,975.00 from exports of the same to South Africa. The seeds were meant to ensure the country produces its own maize meal as it spends millions buying from South Africa. Last year BWP23,775,698.00 was spent on maize meal imports from South Africa, and only BWP6, 996,754.00 was gained from exporting maize meal to South Africa. One event that’s of interest to the discussion at hand is his Africa China Agricultural Cooperation and Development Summit. Through this event Miles advocates for the development of agricultural industries in Botswana, Zambia, Namibia, South Africa, Kenya, Egypt and Morocco. “Our first event ever was held last year in Zambia after we failed to have it in Botswana. Subsequently, we held the second one in August last year in Zimbabwe. Over a hundred people attended. We had invited professors and entrepreneurs from China, and discussions centred on technological development and cooperation,” says Miles. One manufacturer that is delighted by his custom-made equipment from China is Michael Hallam. “Our organic capacity before China was 5 000 tonnes per year. 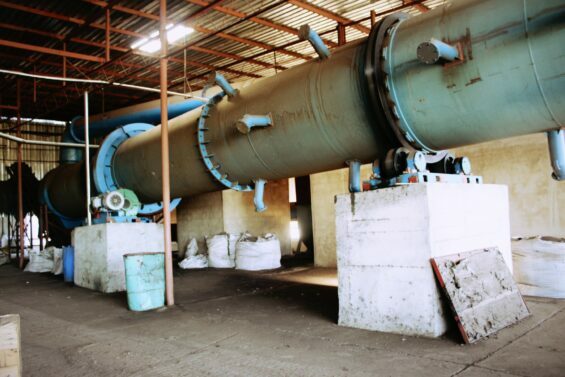 After China came on board the capacity of our granulation plant rose to 30,000 tonnes. 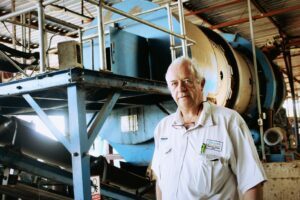 Meaning 25,000 extra,” says Hallam, the Managing Director of the Organic Fertilizer Manufacturers Botswana company based in Mmamashia village. Hallam established his company in 2011, following his employment with a local feedlotting company. Micheal Hallam the Managing Director of OFMB (Organic Fertilizer Manufacturers Botswana), in Mmamashia village, Botswana. “I saw mountains and mountains of manure lying around. Often I used the manure to grow crops that I then fed to animals. So naturally when I left my job I decided to put cow dung and poultry manure to good use rather than let it go to waste as it had been,” he says. His association with manure dates back to his childhood when he observed his grandfather use manure on his fields. The impact that organic fertiliser had on his grandfather’s plants never left him. At university in 1979 he wrote a thesis on the use of manure in cropping production. Fortunately for him he had spent eighteen months in China a few years before. When he found himself in desperate need of custom-made machinery, he took advantage of the networks he had created and located a company that made him a happy man. “I found Qingdao very professional. They shipped equipment and sent two engineers to come and assist with installing. We have not had issues with our machinery since installation in 2016,” he says. Hallam produces fertilizers like the Kalahari and the Neem eco organic by mixing manure with enriching products from India, Mexico, Europe and America. OFMB’s granulating plant was custom made by a Chinese company Qingdao Seawinner Machinery and Engineering, based in China. The plants organic capacity after working with China grew from 5,000 tonnes per year to 30,000 tonnes. The company invested in and installed a state of the art blending, coating and bagging plant with a capacity of 40,000 tons per annum, and a packing and sealing plant primarily for its organic products with a capacity of 20,000 tons per annum. With this massive investment and the granulating plant from china the company is well placed to cover all of Botswana’s fertilizer requirements and become a major exporter of products into the region. OFMB (Organic Fertilizer Manufacturers Botswana) employees packaging 50kgs of organic fertilizer bags in time for transportation to local distributors and South Africa. Sixteen products are already registered in Botswana. Seven of these products are 100 percent organic. Hallam has already started selling his products in South Africa and Zimbabwe. 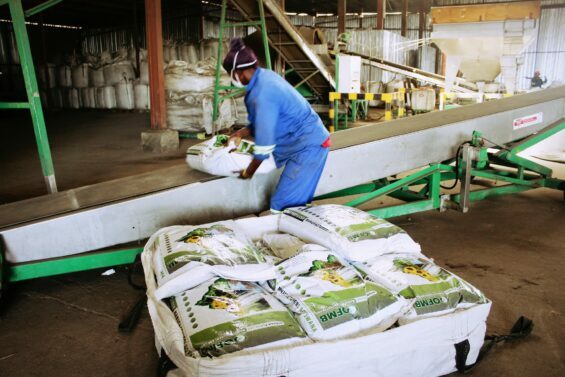 “As the only registered fertilizer manufacturing company in Botswana, we are removing a problem from the environment while creating direct and indirect employment. Cow dung releases methane into the sky,” he says. Adding that, people are now going back to using organic fertiliser instead of chemical fertilizers which have since contaminated ground and surface water resources, and increased salinity of soils, almost wiping out a reasonable population of bees crucial for pollination across the globe. The irony of this being that for every undernourished person there are now two overweight people in the world.